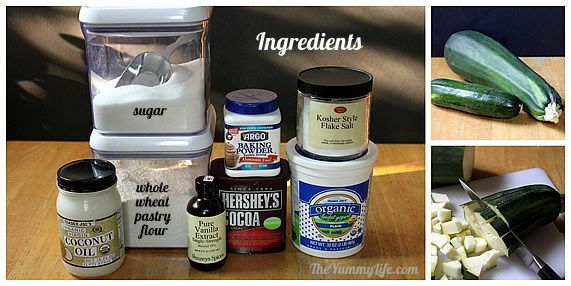 I use this in these brownies and to replace all or part of the white flour in other recipes. It has a finer, lighter texture than regular whole wheat flour. I use this healthy, flavorful oil in place of vegetable oil in many recipes. 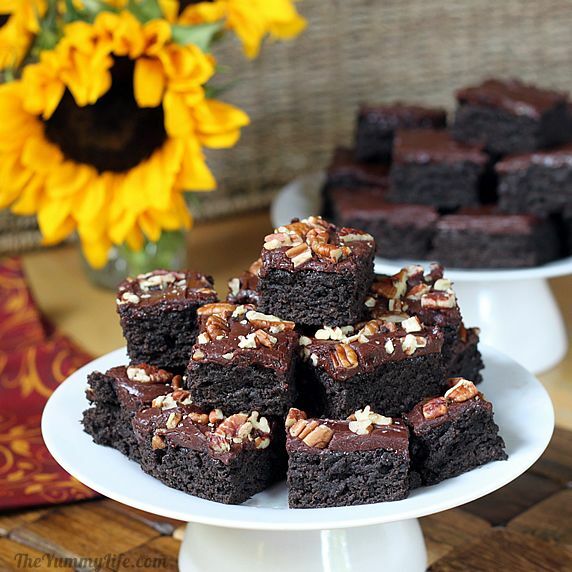 It tastes great in these brownies; I also use it for popping popcorn. I bake my brownies in these pans. I love that they have a cover and are easy to stack and store or freeze. Rated #1 by Cooks Illustrated, this is a workhorse! It does a great job of pureeing the zucchini in this recipe. Mine gets frequent use for blending frozen drinks, salad dressings, and more. This is the Hershey's Special Dark Cocoa Powder I used in my zucchini brownies. It's yummy and high in antioxidants. This gets a lot of use in my kitchen. Use it to whisk dry & wet ingredients, smooth frosting, gravy, and sauces, and for scrambling eggs. I use these versatile bowls every day. Great for both mixing and serving. I love that they nest and can be stored compactly. The bent angle of this spatula makes it much easier to apply frosting smoothly. I use this durable spatula for mixing batter and stirring on the stove. It's heat resistant to 600 degrees and won't stain, melt or warp. 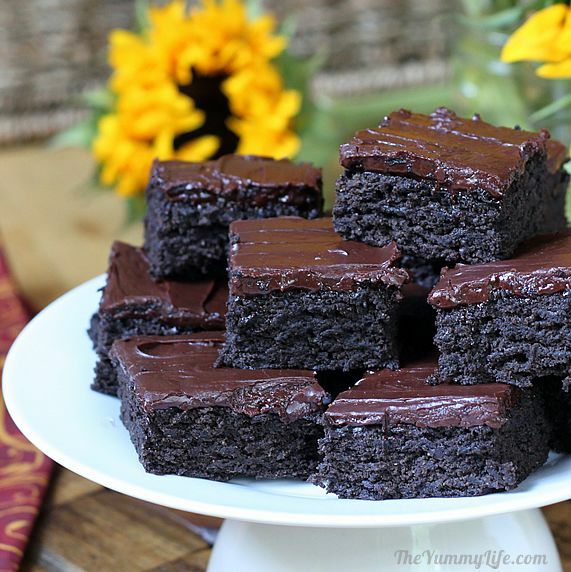 So moist, rich, and chocolaty that no one will guess they have veggies, 100% whole grain, and no eggs. Easy to adapt for vegan and dairy-free. So moist, rich, and chocolaty that no one will guess they have veggies, 100% whole grain, & no eggs. Easy to adapt for vegan & dairy-free. Preheat oven to 350 degrees and grease a 9x13 pan. In blender or food processor, puree zucchini, oil, yogurt, sugar, and vanilla. Set aside. In large bowl, whisk together flour, cocoa, baking powder and salt. Add pureed wet ingredients to dry ingredients and stir until moist throughout. Pour into greased pan, spread evenly, and bake for 20-25 minutes until toothpick comes out clean or with a few moist crumbs. (Overcooking will result in dry brownies.) Remove from oven and place on cooling rack. Cool for 20-25 minutes and frost while still warm. (View photos & tips for making frosting at www.TheYummyLife.com/Chocolate_Frosting) Combine chocolate chips, evaporated milk, butter (or oil) and vanilla in microwave-proof bowl. Microwave on full power for 30-40 seconds. Remove and whisk until chocolate chips melt in and mixture is smooth (return to microwave for a few seconds if necessary). Add powdered sugar and continue whisking until smooth. Spread evenly over brownies while they are still slightly warm. Sprinkle with chopped nuts, if desired. Brownies may left unfrosted, if preferred. Dust the top lightly with powdered sugar for a prettier appearance. 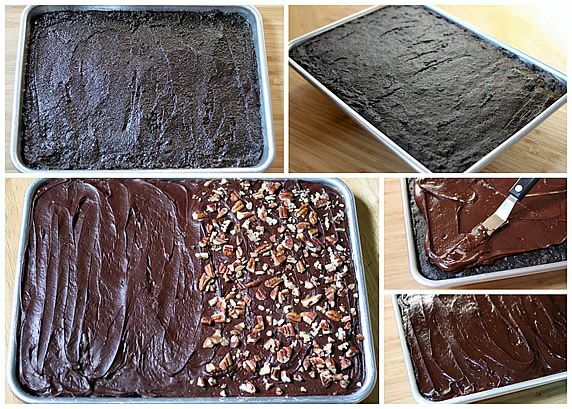 Brownies (frosted or unfrosted) may be covered and frozen. Remove cover as they thaw to prevent condensation from forming and making the frosting soggy. *To make dairy-free/vegan, omit yogurt and increase oil from 1/4 to 1/2 cup. Veggies in chocolate form? I'm all over it! With home gardens and farmer's markets overflowing with zucchini, this is a great time to make a batch of these zucchini brownies. 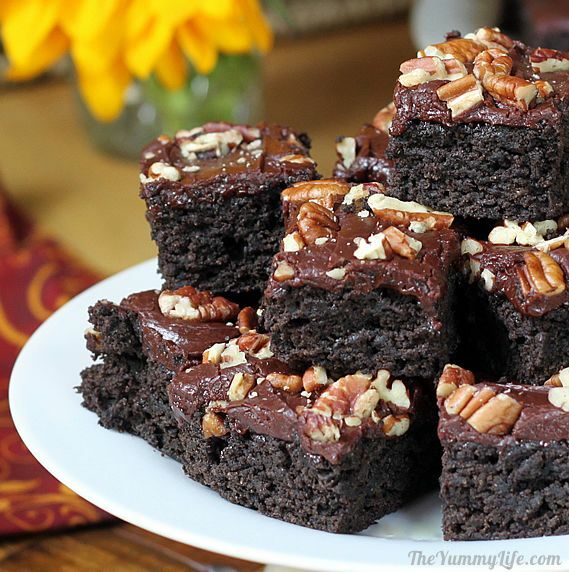 They are amazingly rich and moist and will particularly satisfy those chocolate lovers out there. Vegan & Dairy-Free options. Easy substitutions are listed in my recipe for these dietary preferences. You can't taste the zucchini. If you're offering these brownies to people who are likely to turn up their nose at the thought of zucchini in brownies, my advice is: don't tell them & they'll never know. Seriously. The pureed zucchini disappears into the batter as it cooks. It provides moisture and some nutrition without a veggie flavor--just like the carrots in carrot cake. sugar -- I haven't tried these with alternative sweeteners. Feel free to try substitutions, but I can't guarantee the results. Step 2. 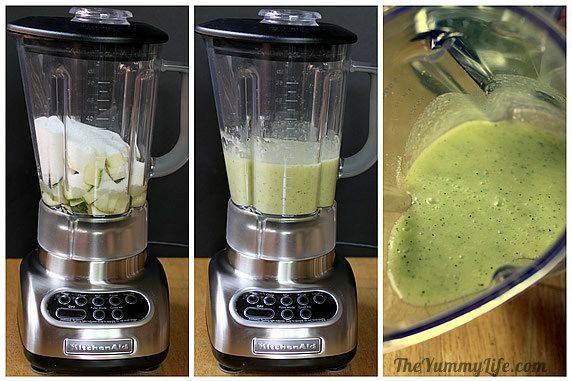 In a blender or food processor, puree the zucchini, yogurt, oil, vanilla, and sugar. This releases the moisture inside the zucchini and the pureed mixture disappears into the batter. Other zucchini brownie recipes call for grating the zucchini, but that results in a dryer batter and bits of visible zucchini in the finished brownies. 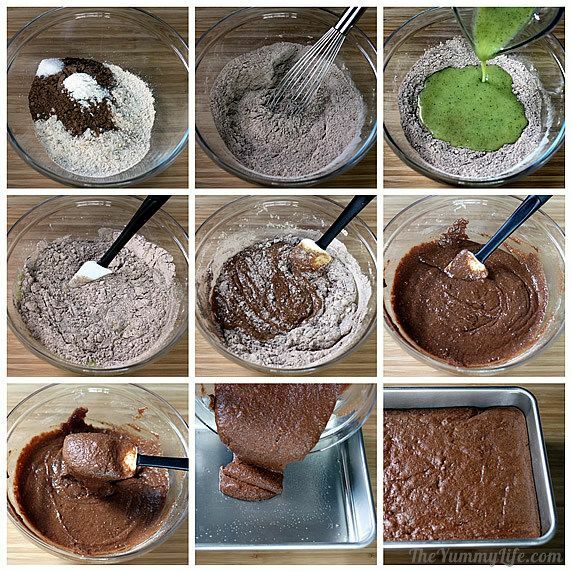 Pureeing these ingredients is an important step for producing a good brownie texture and appearance. Step 4. Add the pureed mixture to the dry ingredients and stir just until it's evenly moistened throughout. Step 5. 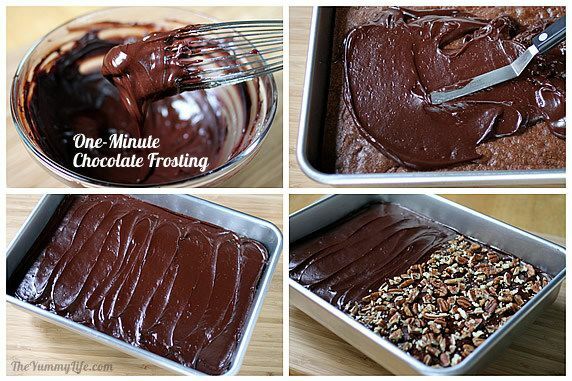 Pour the brownie batter into a greased/oiled 9x13 pan and bake for 20-25 minutes. Step 6. Move to a cooling rack. 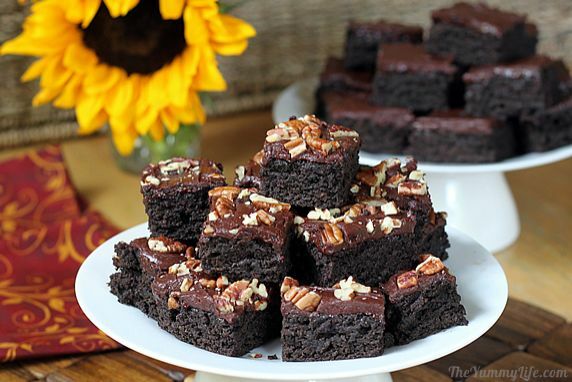 Unfrosted Brownies. You don't have to frost these brownies. If you choose not to, I recommend dusting the top of the cooled brownies with powdered sugar to improve their appearance. I used Hershey's Special Dark Cocoa Powder for my second batch so that I could do a taste comparison. These were hands-down my favorite--moist, rich, and much more chocolaty. But I'm a big chocolate lover. The more chocolaty, the better! Plus, these have the added bonus of more antioxidants from the dark cocoa. You can see the darker batter in the photos below.The regular cocoa powder used in my first batch results in a milder chocolate flavor, if that's what you prefer. Or, cover them and save for later. I think the flavor improves the next day. You can also cover and freeze them. Might as well make a couple of batches while you're at it! I like using these shallow pans that come with lids. 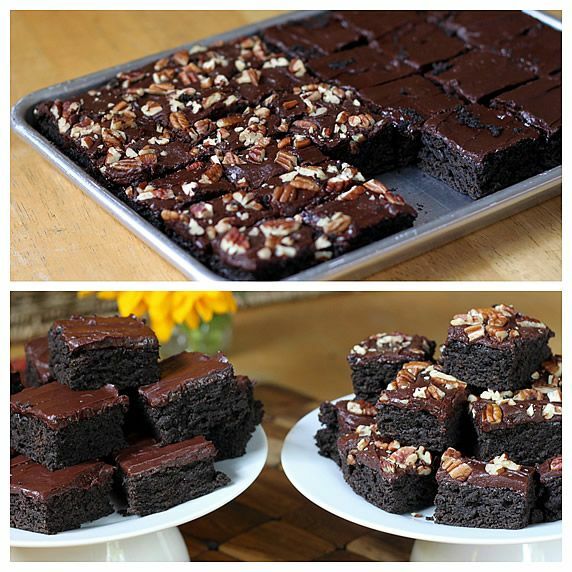 It's easy to cut and remove the brownies from these, and they're great for stacking and storing compactly. Regular 9x13 baking pans work fine, too, if that's what you have. You can see how moist and chocolaty these are. They really do taste amazing. Honestly, no one would ever know they've been healthified. Here's my favorite way with chopped pecans on top. Questions? Suggestions? Leave a comment; I'd love to hear from you.